"Los Cerritos Center has served as a shopping icon for Southeast Los Angeles and Orange Counties for over thirty years. The history of Los Cerritos dates back to September, 1971 with the Phase I opening of the area from Broadway (currently Macy’s) to Orbach’s (currently Mervyn’s). Phase II followed in 1972 with the opening of the area from Orbach’s to Sears. In 1981, Phase III went into effect with the opening of Nordstrom and it’s adjoining wing. In November, 1993 Phase IV was completed when the Palm Court Cafes debuted in the Center with 14 eateries, showcasing a wide variety of foods sure to fulfill any appetite. The most recent transformation, Phase V, occurred in 1994 with the renovation of the Center. At this time, skylights were added to take advantage of the Southern California sunshine, and marble and stone were added to the inside walkways, along with new benches and interior landscaping. 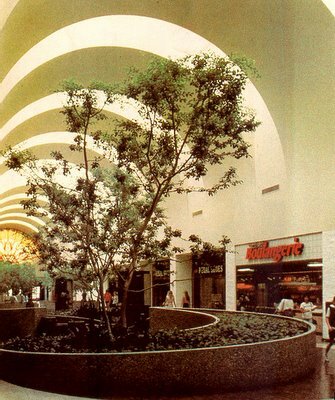 At the same time, a unique 'clustering' concept was put into place as each wing of the Los Cerritos Center received a name, a defining design criteria, as well as a specific tenant focus. The Garden, located between Mervyn’s and Sears, took on a family and entertainment oriented theme showcasing such stores as Picture People, EB Games and The Disney Store. The Grand Hall, located between Nordstrom and California Pizza Kitchen, took on a fashion theme featuring Ann Taylor, Guess?, GAP, GAP Kids, and Banana Republic. The Avenue, beginning at Macy’s and ending at entrance to Grand Hall , was geared towards merchandise for the whole family. In this wing, shoppers can find a variety of stores ranging from Express Men and Hot Topic, to Whitehall Jewelers, New York & Company and the Limited. Today, Los Cerritos Center ranks as one of the leading southern California shopping centers offering four major department stores: Mervyn’s California, Macy*s, Nordstrom, and Sears. The center features over 180 specialty shops, the Palm Court Cafés, several sit-down restaurants, and the 11-screen United Artists Theatres." The roof design reminds me of Time Tunnel, which was one of my favourite TV shows as a kid. Holy huge! That's one big mall. I love the ceiling; very dramatic and architectural. Didn't something bad happen to this mall in the past? Like a plane crash or Tiffany singing? 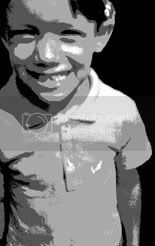 Jarman is still around abeit it not in a very large presence. I know there is one at Harlem and Irving Plaza in Chicago, but I haven't seen any others around town. Found it... a horrible mid-air crash did occur over Cerritos and it devastated a neighborhood (but not the mall). Either way, its an unfortunate disaster. The plane crash was on the east side of the city, about a mile or two away from the mall. Oddly, I was at this mall today. 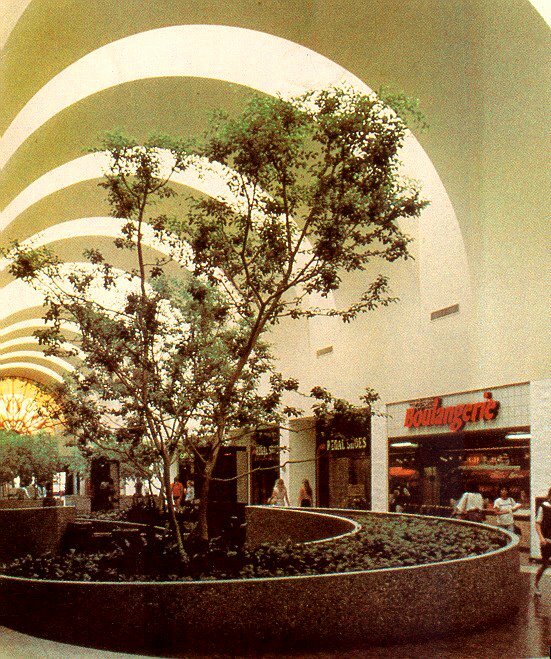 The mall looked like this through the 1994 remodel. A Large Robinsons (Later Robinsons May) was located where that glass looking thing is. That store just recently closed. The picture of the Los Cerritos Center is from a 1980s Southern California Rapid Transit District (RTD) service brochuer for the southeast area. RTD used other malls including Glendale and Montebello for covers of brochuers. Worked at Both Coco's Jrs., 1972-73. One of my memories of the mall was waiting for my brother to come off of work at the Harvest House, next to that famous drug store(can't remember it)! I'd wait until 12 or even 1 A.M., listening to 8 track music from Black Sabbath or The Allman Bros., even in the rain. Or watching movies all day on one ticket. Or getting from one side of the mall to the other by short-cuts only mall employees would know. Or managing restaurants at nineteen, wearing bell-bottom pants with an American flag tie! Or even having two wanna-be-my girlfriends at the same time! Good reason I'd probably never go back to CA. ; You can't never go back home! I really thankful to you for this great read!! You did a very great job, keep it up.